We have an original selection of custom wall scones to choose from. Several pieces are fully made by our in-house artisans, so you won't find them anywhere else. 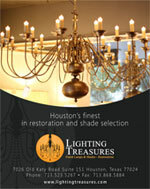 If you want an one-of–a-kind wall sconce, Lighting Treasures has it.